Why is this? What causes it? Second, besides reporting a site blocked in error, do I have any control here? How long does it take for a site to be reviewed and unblocked. For example, a local doctor's office has a patient portal we need to log in to. It's blocked. Zscaler is the 3rd party service that eero Plus uses for filtering. In regards to the different kinds of pages/error messages you got, I’m guessing Zscaler was having temporary service issues. You could try again and see if you consistently get the eero blocked page now. There’s no ability to “whitelist” (or unblock) a website manually by yourself. I don’t know what the reporting and review timeline is, but I’m assuming that is out of eero’s control. In the meantime, a workaround would be to just disable the filters while you access the patient portal and then enable them again when you’re done. cMoo92 Ok, I figured that's who Zscaler was. Here's another question: how long after you remove a device from a profile until you actually see the change? I was experimenting yesterday, and was getting the cert error, pulled the device out of the profile then started getting the Zscaler error, then I put the device back in the profile and started getting the eero message, then I sent an email to eero about the blocked page, then it started working. 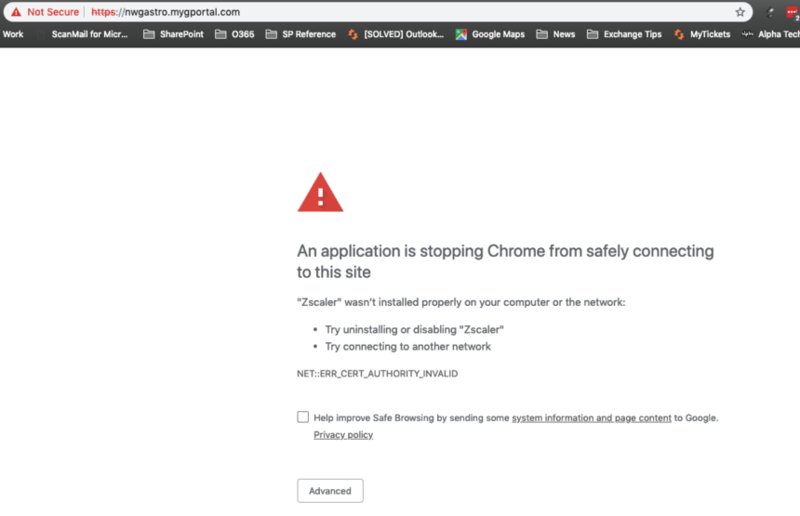 But this morning I get now a completely different message: " "Zscaler" wasn’t installed properly on your computer or the network:"
Starting to wish I'd stuck with Uqiquity! Sorry to hear you're having some frustrations here, ScurvyMrO – removing a device from a profile should remove the filter more or less immediately, but toggling the WiFi or forgetting and rejoining the network can help facilitate that as well. Past that, we strongly encourage you to follow up on your support email with screenshots and URLs of these error messages so that we can lift it up to our eero Plus team and investigate this for you ASAP. We look forward to hearing from you so we can get to the bottom of this unexpected behavior! Drew So, when I browse to the site with the device in the profile, get a cert error. I'm attaching the error that Chrome gives, plus the information about the cert. Obviously, nwgastro.mygportal.com is not associate with zscaler, so it's doing something weird here. This morning it is not bouncing between the three pages as before. If I remove the device from the profile, close the browser, then I can get to the site. Add the device back to the profile, after 2 or 3 minutes, back to the cert error. Thanks for providing this here, ScurvyMrO, and apologies for any misunderstanding. It would actually be best for you to send this information along to our team directly on the email thread that you already had open with eero Support so that we can coordinate and investigate with you directly. We look forward to hearing from you! ScurvyMrO after removing the device from the filter, you might need to clear your browser cache, and also doing a DHCP refresh might help. This is all speculation on my part though. You should be able to get some definitive answers by reaching out to eero support.